The world is changing - rapidly. Technological advancement in the last generation alone is simply incredible! If you visualise the history of human technology as a timeline, the last few inches have produced unbelievable progression. This world of ours would be unrecogniseable to those living merely 100 years before us. What about those living 100 years after us? Even within living memory, technological advancements are impressive. The clichéd saying, ‘well, in my day…’ is proof that our planet Earth really is moving at a blistering speed. Technology is now so readily available it has replaced certain things almost entirely. When was the last time you saw a tourist with an actual map? I mean one made of paper! Or marked the days off your wall calendar? Things change, they evolve. And so should our attitudes to technology. Many see technology as a way of making things easier. Instead, we should see technology as a tool for making things better – more engaging, more meaningful, more innovative and expressive. Here at BSB, we are working hard to embed technology into our curriculum. By integrating the use of technology into everyday lessons, we aim to better equip our students for the complexities of modern day life. Teaching of and about technology is important but so is teaching with technology. 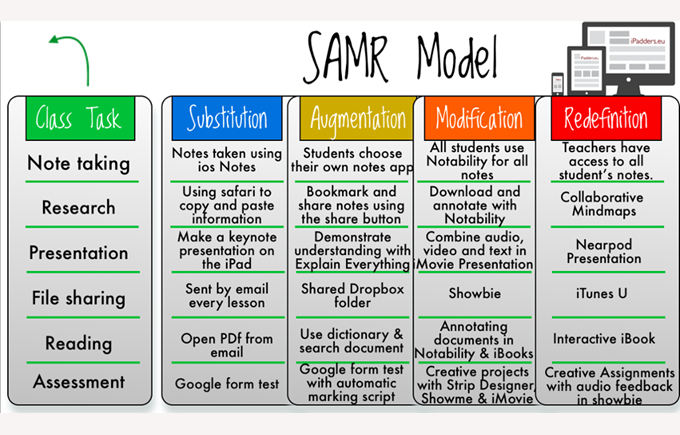 At BSB, teachers have been exploring the use of technology within classrooms using the SAMR Model. The first step of the integration of technology is to use it as a substitute for a traditional task. Next comes augmentation, which adds some kind of functional improvement. Above this is modification, which adds a level of task redesign – the first step of transforming a learning experience. 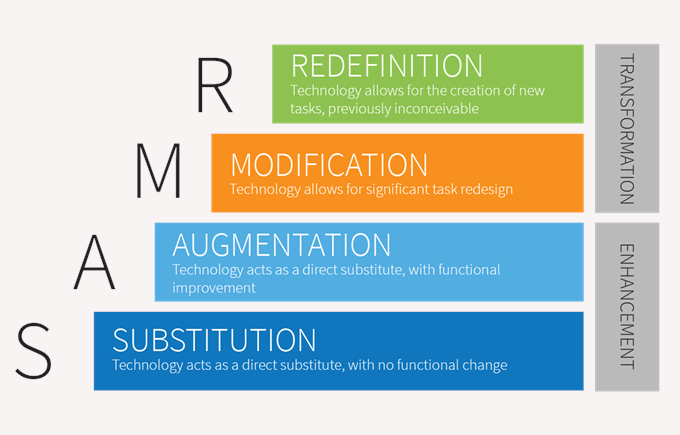 Finally, the pinnacle is redefinition, which is when technology allows for something new. Something that before technology, was impossible to achieve. By using this model we hope to continue taking steps towards transforming learning through the use of technology, rather than simply enhancing. Recently in Year 4, we took a flight inside a Red Arrow jet (using our virtual reality headsets)! We thought about what we could see and hear, and how we felt. We then put this experience into writing, with fantastic results! Harnessing technology provides an opportunity where it previously did not exist.